When I bought the 1959 Giulietta Sprint a few years back the PO had installed Duetto round tail Spider seats in it. I never really learned to like them so when a pair of unknown Italian, probably Alfa Romeo or Fiat seats in good shape for $300 came up for sale on Craigslist I decided to go for it and bought them. There were no seat tracks included and one seat had a rusted bolt broken off in the base but other than that they were in original and very nice condition. I pulled the Duetto seats out and sold them to a friend which turned out to be a mistake because it didn’t occur to me that the track widths of the seats could be different than the car. Last weekend, a year after removing the Spider seats, I finally got both seats neatly and permanently mounted. 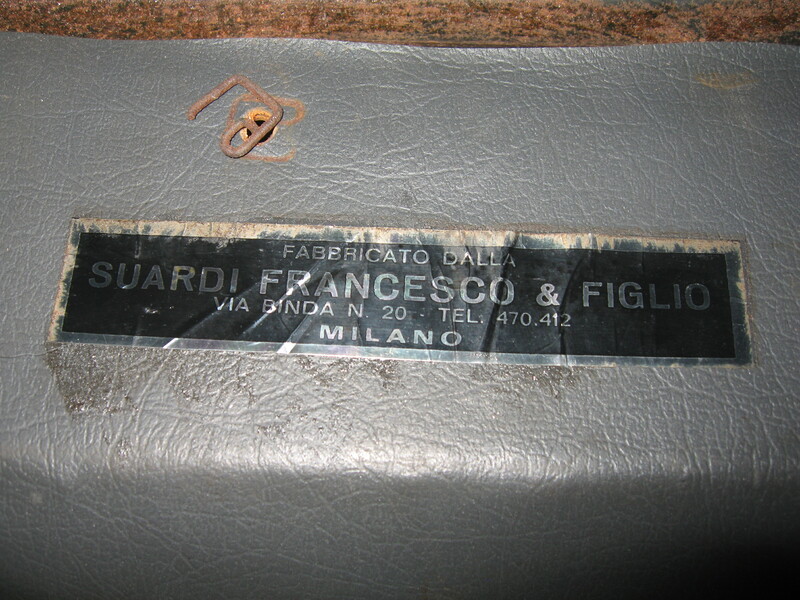 “Fabricato Dalla Suardi Francesco & Figlio, VIA BINDA N 20, TEL. 470-412, MILANO.” Anyone know anything about these people?